Hezbollah fired a new rocket, called Khaibar-1, striking near the Israeli town of Afula, south of Haifa. Israeli authorities reported that several of the rockets hit fields outside Afula, causing no casualties. Israeli police said those rockets were carrying about 220 pounds of explosives. The air force claimed it destroyed the launcher. The Israeli air force also claims it hit Hezbollah's missile control center in the Lebanese port city Tyre, and that's why there weren't as many longer-range rockets hitting the Israeli port city of Haifa Friday, reports CBS News correspondent Dan Raviv in Tel Aviv. No rockets hit Haifa at all Thursday. Still, Hezbollah has managed to fire about a hundred rockets a day at Northern Israel, wounding a few civilians Friday. 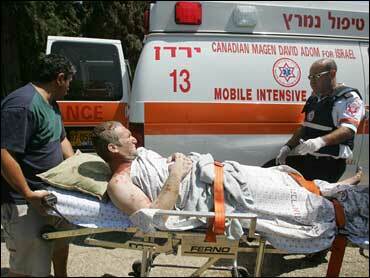 One rocket hit the top floor of a hospital in Nahariya Friday, but there were no injuries. U.S. Intelligence tells CBS News national security correspondent David Martin that Israel badly underestimated Hezbollah's strength, and is now bogged down around Bint Jbail. The Israelis therefore are making preparations to go farther north in larger numbers. Secretary of State Condoleezza Rice will return to the region Saturday, President Bush said, and that he and British Prime Minister Tony Blair agree that a multinational force must be dispatched quickly to the Mideast. Both U.S. and Israeli officials tell CBS News' Charles Wolfson that senior U.S. diplomats are now meeting with Israeli officials in Jerusalem. The United Nations decided to remove 50 observers from the Israeli-Lebanon border, locating them instead at posts with 2,000 lightly armed U.N. peacekeepers. The move comes days after Israeli bombs hit a U.N. observer post, killing four. The United States evacuated about 500 more U.S. citizens from Beirut aboard a chartered cruise ship, believed to the last U.S.-organized departure for Americans. Some 15,000 U.S. citizens have now left Lebanon since fighting erupted. The European Union said Friday it has completed evacuating most of its 20,000 citizens who wanted to leave Lebanon, and will now help with mass evacuations of nationals of poorer, non-EU countries. Israel is hoping President Bush will not bow to international pressure and settle for just an "immediate cease-fire." Instead, says an Israeli diplomatic source, Israel wants an "enduring cease-fire." British Prime Minister Tony Blair, the other major holdout with the president for an "enduring cease-fire," was meeting Friday at the White House with Mr. Bush Friday. United Nations resolution 1559 calls for the disarming of Hezbollah, but in addition, reports Wolfson, Israel wants the release of the two Israeli soldiers Hezbollah took hostage earlier this month, an end to Hezbollah's rocket attacks against Israel, and the international community assurance that Hezbollah will not be allowed to rearm or re-supply. Israel further wants an understanding that if it detects any re-supplying of Hezbollah after a cease-fire is implemented, it can destroy that target without being held in violation of the cease-fire.